Hello Ditch the Wheat Readers! I’m Monica Bravo from the blog, Bravo For Paleo. I shared my story previously with you all; you can read that here! Today I’ll be sharing a Grain Free Breakfast Pizza. 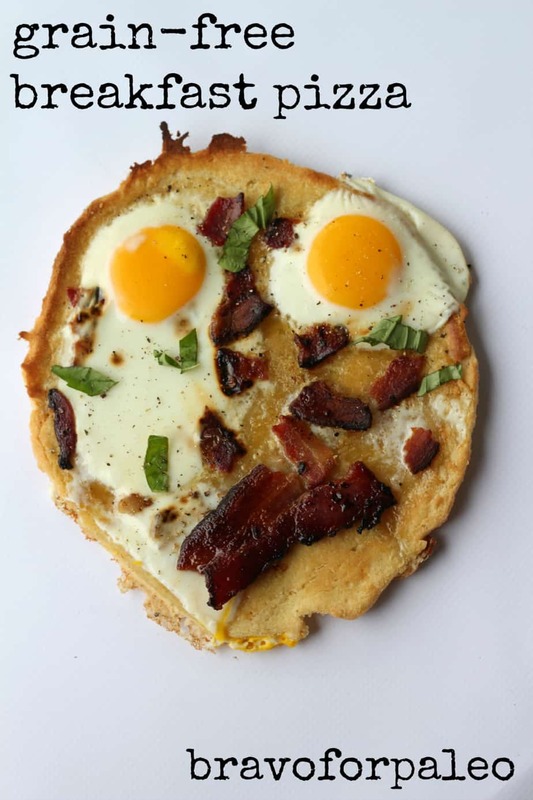 I combined my two favorite Paleo foods, bacon and eggs, and my former favorite junk food, PIZZA. As some of you may know, I’m a college student, and one of my main goals is to help college kids eat real food. For this reason, I started the College Primal Challenge. It’s an eBook with explicit, straightforward guidelines on what’s Paleo, tips on how to conquer the cafeteria and food court, the 411 on alcohol, and 25 simple Paleo recipes. (Carol’s note~ The ebook is great and gives very clear directions on how to eat primal with cafeteria food). When I did some investigating for the book, I found that almost every college student’s favorite food is pizza (understandably!). But as it is, so many of us are running on little sleep and too much stress. There’s no reason we should be fueling our bodies with junk food too. So now I bring you this Grain Free Breakfast Pizza. It won’t leave you feeling groggy from the gluten of normal pizza; in fact, it will do the opposite. The crust took a bit of recipe testing, but I’m sure of it now. A mixture of tapioca and almond flour is the way to go with a grain free pizza crust. It gives a perfect crispy thin crust, that holds very well! Now that you have a crust, there are endless topping options. Throw on your favorite vegetables, meat, and fresh herbs and you’re set! If you consume dairy, make an old-fashioned cheese pizza. I understand this grain-free cooking/eating thing can be hard. Some of my readers say the hardest part can be motivation. If you purchase my new eBook, the College Primal Challenge (only $3), you will receive 30 days of motivational emails to help you stay inspired. 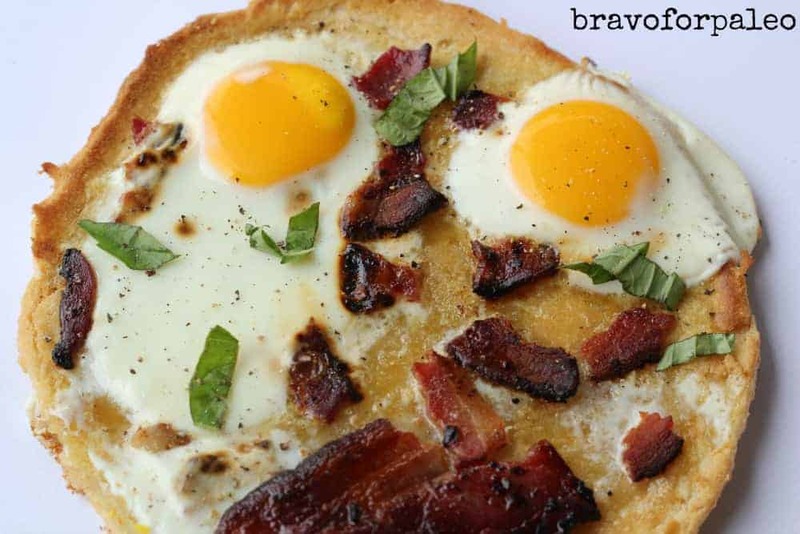 Want even more Bravo for Paleo? Sign up for my monthly newsletter and get the latest of my recipes. See you again soon! Roll dough onto a pizza stone lightly covered in tapioca. Roll it very thin. It should make a 10-12 inch pizza crust. Place in oven for 8-10 minutes, or until lightly browned. Remove from oven and lower oven to 450 degrees. 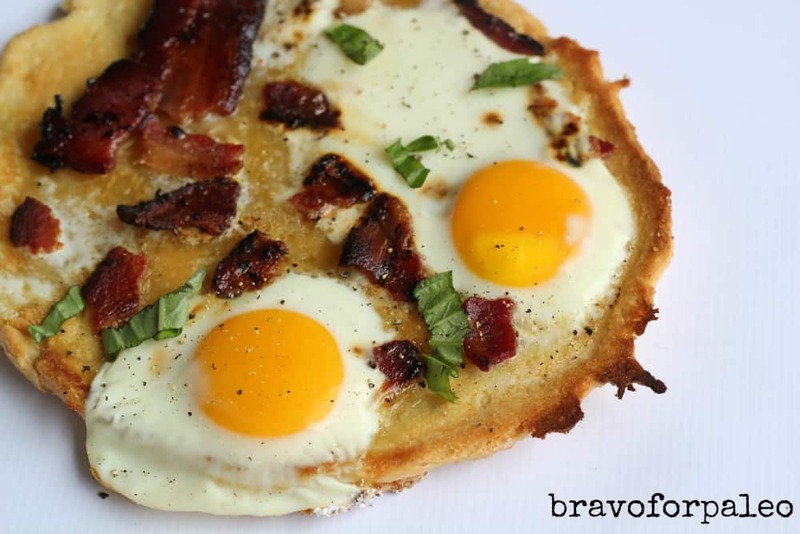 Top pizza crust with olive oil, eggs, cooked bacon, and basil. Cracking the eggs into a bowl first will help you keep the yolks together. Place in oven again for 7-8 minutes, or until eggs are to your liking. Serve for breakfast, lunch, or dinner! When rolling out dough, be sure to lightly cover your roller in tapioca flour to prevent sticking. If you do not have a pizza stone, use a thick cookie sheet. Monica blogs at Bravo for Paleo. She’s from a small town called Covington, Louisiana. She is currently a student at LSU in the Honors College with a Biochemistry major and Anthropology and Business minors. She enjoys cooking, hiking, ballet, snow skiing, traveling, spending time with family and friends. She plans to become a doctor and treat patients holistically using food as the greatest form of medicine. Coconut flour based pizzas don’t taste great. You can sub ground up seeds or another nut. If I were you I would google “arrowroot flour pizza” or “tapioca flour pizza” if you can’t eat almonds. You could also try the cauliflower pizza. It’s cauliflower mixed with cheese and eggs and it is really good. Made this for breakfast and added pesto to it, it was delicious! Think we will use this crust for non breakfast pizzas as well. Yummy crust that stays flat and doesn’t get limp like other paleo crusts we’ve tried. Thank you! What could I sub for coconut cream. We unfortunately don’t get that here in South Africa. I’m lacto-paleo, so could I use dairy cream? Thanks for the recipe! My husband has been experimenting with gluten free, and he says he feels so much better…I will pass this recipe along to him.